Part of standards based grading is getting students to remediate before being allowed another shot at demonstrating their mastery. Reassessing shouldn’t be a “free pass.” I think I wrote previously about how I deal with this. They have to send me a form email. … Also, you cannot say you are going to do something to remediate the skill. You can only say things you have already done. You also need to be more specific. In the future, I won’t accept “I went over the assessment” when you have more that you need to have done. Please talk with me if you have any questions about what is expected to reassess. Most importantly, though, I want to remind you that I’m always here to meet to help you, so hit me up for help. 1) Why specifically don’t you think you had a firm understanding of the material? What didn’t you do that prevented you from having a firm grasp of the material? The point is to be honest here, so that you can learn from your actions. If you didn’t study, say that. If you just looked over problems, but didn’t practice them, say that. Whatever. 2) What specifically about skills 49, 51, and 52 did you get wrong? What were you doing incorrectly for EACH one of them? Overall I felt like the email-to-apply-for-a-reassessment was good. It’s worth considering if you don’t know how to deal with the bureaucracy of ensuring remediation and setting up reassessments. I do think I need to be more particular early on in what is acceptable and what isn’t, in terms of an email. I went over it in class, but just once, and that clearly wasn’t enough. As I write this, I think I should also call sending that email “applying for a reassessment” because I think by the end, students were taking it for granted that they’d be approved. Many were. These changes to the reassessment request also subtly incorporate something I want to include more of in each of my classes, which is more writing and self-reflection about the student’s learning process. I’ve noticed that requiring students to write about their learning process seems to turbo-charge their conceptual understanding — both of the task at hand and of what can go wrong (or right) in a given situation. It also does generate exponentially more whining, but that just gives me the opportunity to point out (in the nicest possible way) that the surest way for them to minimize the amount of writing they have to do in math class is to pay close attention during the learning phase and get things right the first time they assess. Thanks for the great ideas about keeping students accountable. I wanted to run an idea by you about how to do it. My school is fortunate enough to have google accounts for each student. I was thinking about using a Google Form instead of an email for their Reassessment Application. Just wanted to share the idea with you and see if you had any thoughts about it. Thanks. Anyway, next year I’m entirely changing how I do out-of-class assessments (I’m also nixing the word “reassessment” because it turns into “retest” which turns into whining about how this problem doesn’t look anything like the one they got wrong last time… so just in-class assessments and out-of-class assessments from now on. Actually, at least one kid started saying SIA – student-initiated assessment, which tells you just how lovably dorky my students are). Just completed my first year of SBG and overall I liked it. Your post really hit home on where I need to improve for next year. I did have a re-assessment sign up sheet this year that asked similar questions of the student but too often my students replied “I studied”. Next year, I plan on having the students attach to the sign up sheet the homework assignments and corrections on the 2 “in class” assessments. Currently I do not check the homework at all. I also struggled with making good re-asssessments. I have a lot to improve on next year. I thought I would have predicted some of the problems that arose a little better. I implemented SBG ideas very similar to yours this year. In fact, I took some ideas of yours (imitation is the sincerest form of flattery and all that….!). 1) students waited too long to do it. I put an approximate 2-week limit (after returning tests) to re-assess. Students waited until almost the last day just to notify me of their intent to re-assess. The longer they waited the worse they did. 2) on my re-assessment form, I had them reflect on WHY they didn’t do well the first time. Their responses were terrible: “oh, I made little mistakes”, “oh, I panicked” — I would tell them if all they made were little mistakes, then they’d actually have a good/excellent grade. What they didn’t say, and it was months before one student actually said it, “I didn’t do my homework”. That’s nearer the truth for many of them. The good news this year, though, was that re-assessment didn’t take over all of my time like I thought it would. It took extra time, sure, but it was manageable. One of my projects this summer is to make a bank of more questions for assessment. As for re-assessing, my biggest surprise was that many students chose NOT to re-assess! (this is honors, too!). I think back, even last year when I had a lazy group and grades were low. There I was agonizing about why, why, why, and what could I do to improve the grades….what I discovered is that I agonized over it far more than they did. The ones who didn’t re-assess accepted their grades. The ball was in their court, and they didn’t play. And I didn’t have to agonize over anything this year. So I guess it balances out — more time for me to do re-assessment, less time I spend agonizing over grades. I’ll take it. Anyway, I thank you for your blog — I got some great ideas back in the fall, and all in all, my first year of SBG was a success! Wow, these are really awesome reflections. Thank you THANK YOU for sharing. I think you did something really right when implementing it, if your kids felt their grades reflected their learning. I think my kids were slightly offput by the 0, 1, 2, 3, 3.5, 4 system, because if they didn’t know something and got a 1/4 or 2/4 on a skill, they thought that was unfair. I couldn’t get them to see that not as a 25% or 50%, but as a statement about how they were not able to demonstrate their knowledge/ability. Mine are so so so so grade conscious, but a few clearly want the grade without doing the work. I’d LOVE to hear that. I am really struggling with the HW question. I was going to write a post about it, but hey, if you want to write a post on my blog (guest post?) about your experience with HW and your ideas on how to deal with it, I’d love it. If so, def email me (samjshah at the google mail)! In addition to the email did you have students show evidence of what they have done ( hw, extra problems, etc. )? I am interested to see how you deal with the homework situation. I also really liked how you mentioned that students “apply for re-assessment”….Thanks for sharing. I’m a physics teacher, but I like this idea a lot. Are your numbered skills posted somewhere on your blog? I’m curious how you compartmentalize and assess individual skills. I suspect that a sub-set of the list would be the skills for which I want my physics students to have some proficiency. Thanks. Umm…. This is totally badass. 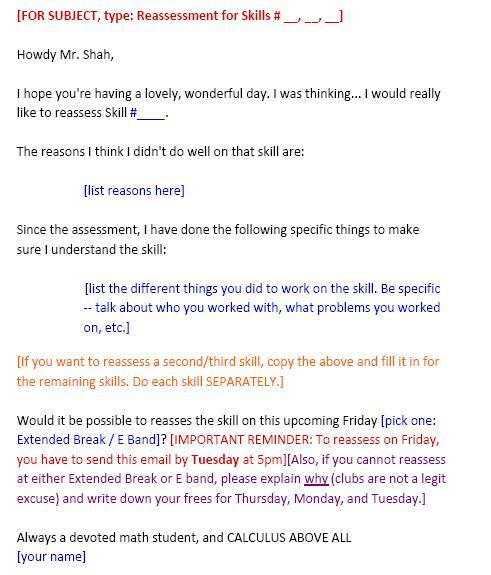 This is why every single effing teacher needs to have an online PLC that includes Sam Shah. I really like this Sam. A lot. I think I’m going to “borrow” this and modify it a little. I think it would help with some of my issues that I mentioned in this blog post: http://oldmathdognewtricks.blogspot.com/2011/06/time-to-tweak.html. I’m also looking forward to your aforemetioned post on homework. I’ll be curious to see what your issues and possible solutions are. Last, but not least, I second Shawn’s comment. Thanks for sharing! I’m revisiting this post after returning my first quiz in Hon. Pre-calc with no clear strategy in place (been that kind of start to the year.) I thank you for laying out the path so nicely here. I need to seriously tighten up my reassessment system and plan to use many of your ideas for student initiated requests. Pingback: Conjunctive Standards-Based Grading « Physics! Blog! Hiiiii! I totally feel you. I was super nervous to start SBG, because no one in my school does this and I only had online people who could help me (and they did, so so so much). And it was a lot of work in my first year doing it, but I’ll tell you what could happen for you which would be awesome. As a first year teacher, if you introduce it right and implement it well, your students might recognize what you’re doing as showing how much you care about them and their learning, and it might just help you get their respect — as long as you are clear, consistent, and fair about it. I think misscalcul8 (http://misscalculate.blogspot.com/) did SBG and struggled initially, and she wrote a lot of good stuff about that, so maybe it’s worth reading that side too. I worked hard, and had a few kids who really didn’t respond well to it, but I worked out those kinks in the second year. My only advice is to stick with your guns and be consistent about how you do things — and don’t change things as soon as things don’t seem to be working. It takes a while for kids to figure it out… and that initial period where kids weren’t doing well freaked me out. But I had faith, based on everything I read, and it turned out okay. 1) Built-in tracking (inc. filtering, searching, etc.). 4) Required fields and other validation. 5) A central point for timestamping, reducing the opportunity to fiddle with key data. I really, really, really like the email form for applying to retake an assessment. Now to implement…..